Green Visions is planting new seeds. 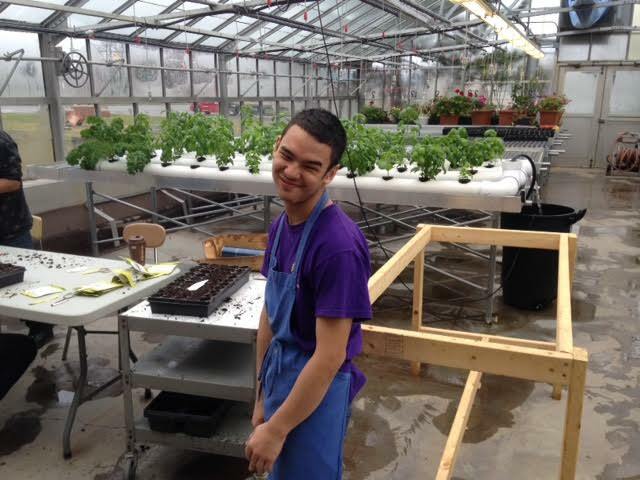 Not just the kinds that produce great cut flowers, but the kinds that produce opportunities for a new group of youth – developmentally disabled students at Edison Career & Technology High School. Students recently planted 5,000 seeds in the Edison greenhouse that will be transplanted into Green Visions’ gardens in the JOSANA neighborhood later this spring. Two students from the program have been selected to be among the 15 interns who participate in Green Vision’s job training by working 20 weeks, from May through October, in the cut flower gardens in northwest Rochester. Another six to eight students in the program will come as a group to the Green Visions gardens once a week for 10 weeks, too. Their performance as volunteers will help identify future interns, who are paid a stipend for their work. “One of the major hurdles for people with a disability is getting that first job,” said Lewis Stess, co-founder of Greentopia. So far, most graduates of the Green Visions programs have gone on to jobs, but not within the landscaping field, Stess said. But the students from Edison may be an even better fit for this kind of landscaping work. “They could become great gardeners, great landscapers, great bouquet-makers,” he said. Meanwhile, Green Visions has just been recognized by the Rochester region chapter of the Sierra Club with its annual Environmental Leadership Award. Morgan Barry and Tiani Jennings, managers of Green Visions, accepted the award April 21. This latest accolade and the new partnership with Edison come at a time when Green Visions is ramping up its ability to serve commercial accounts. Last year Green Visions provided 15 bouquets a week to Wegmans’ East Avenue store. This year the order has been upped to 100 bouquets shared among three Wegmans stores. Youngsters 18 to 22 who come from the Northwest part of the city will still fill most of the internships Green Visions provides. In a neighborhood like JOSANA, paid internships can be a rare opportunity leading to sustained employment. Besides providing a job reference and experience, the Green Visions program also provides certification in job and environmental safety practices — important credentials for landing another job. Such training may be even more valuable for Edison’s students. Morgan Barry, program director for Green Visions, noted that the unemployment rate for 20- to 24-year-olds with disabilities is 70 percent nationally, which is double the rate for their non-disabled peers.